The 140-character limit has long been considered Twitter’s defining trait, setting the social media channel apart from its heavy-hitting competitors (e.g. Facebook and Instagram). And now they’re considering abandoning it. Late last month, Twitter began to test doubling the standard 140-character limit. The update initially became available to a small group of users so the company could observe the outcome. The social media channel’s character limit expansion announcement, however, suggests the intention to eventually make this new update the norm, at least in some countries. 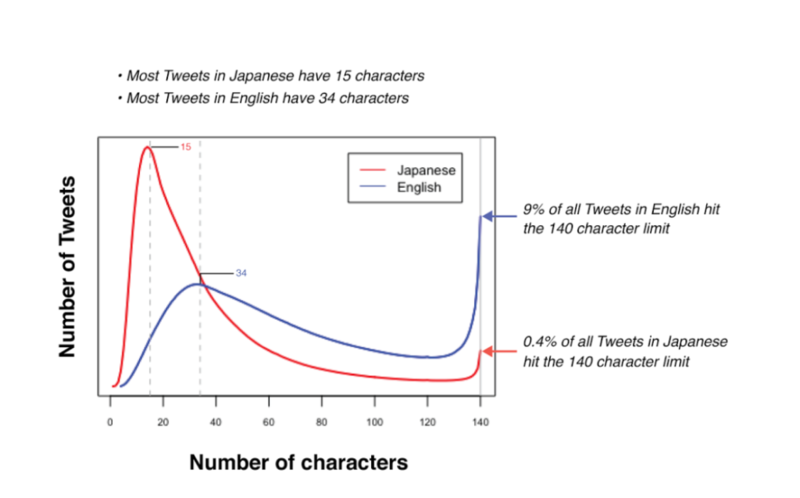 The realization that, in some languages (including English), there are a high proportion of tweets published with exactly 140 characters inspired the limit adjustment. This indicates people frequently write tweets longer than the original limit and must edit to fit before publishing. If people are regularly forced to edit their thoughts before pressing that “Tweet” button, it may have a negative effect on their experience using the product. As a response to the limitation, many people link a series of connected tweets into threads to tell a longer story. This demonstrates that the character count is too low for many people to fully communicate a thought in a single tweet, yet wasn’t keeping users from saying everything they needed to regardless. This isn’t the first move Twitter has made to give users more characters. In March of this year, the social media platform stopped counting usernames toward the limit for replies. In 2016, they made a move to exclude gifs, polls, and quoted Tweets from the character count, and began counting links as having fewer characters in 2013. While Twitter has been moving in this direction for years, making such a significant change at this moment may very well relate to the company’s drop in monthly users this year. If user frustration regarding editing speech is causing the decline, this might be Twitter’s attempt to get those users back and attract new ones. 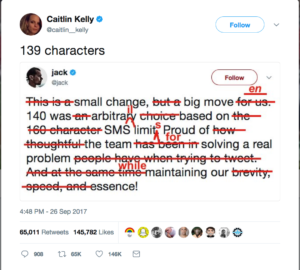 While some Twitter users are taking advantage of the extra characters without much comment, many are complaining that the character limit was never the core problem. Rather, many users are saying that Twitter should be addressing trolls and harassers plaguing the social media channel. Despite some backlash, the actions of users on Twitter will have more impact on whether the character limit expansion is kept permanently. If users continuously take advantage of the 480 characters, and Twitter also sees a growth in its user base as a result, it’s likely that the extended limit will be here to stay. For marketers who have spent years finding ways to promote products and interact with characters in 140 characters or less, this update means adapting your strategy based on a change made by a tech company (a familiar feeling by now). Here’s what you need to know. It won’t really change how Promoted Tweets work. If you advertise on Twitter, this won’t really change anything about your process of selecting, paying for, or tracking the success of Promoted Tweets. The only way it changes anything is that you can write longer Tweets that you can then choose to promote. Don’t feel like you have to use the full limit. Brevity has always been a big part of the appeal of Twitter, so there’s no reason brands should feel pressure to double all their tweets. Don’t add in filler just to use the space you have. Any time you can say what you need to in less than 140 characters (and you probably can most of the time, you’ve managed to do so for this long), then keep it short. Only take advantage of the longer tweets for those times when you would find yourself awkwardly cutting what you’re saying short. And don’t overuse hashtags. Brands have already tried that and research has clearly shown that anything over two hashtags decreases the amount of engagement a Tweet will get (although one or two hashtags increases engagement). Basically, just keep doing what you’ve been doing when crafting tweets, but enjoy that extra space when you need it. It gives you more room to provide customer service on the platform. While customer service and marketing are usually handled by different departments, the public customer service that gets performed over Twitter definitely impacts how people see your brand, so marketing has every reason to pay attention and make sure it gets done well. Where most brand Tweets will benefit from continuing to keep things short, responses to customer service issues people report to you on the platform can likely be improved by using the extra space. You can provide more detailed responses without sending the customer to another form of communication to resolve the issue (a move likely to lead to frustration). Images and videos will still be better for standing out. Some marketers worry that longer tweets will make it harder for brand tweets to get noticed. If the Twitter stream becomes filled with longer messages that take more time to read, then people getting to your tweet in the feed and choosing to read it may be less likely. This may not become a concern at all if a majority of users continue to keep most their tweets on the shorter side. But even if it does, the best way to stand out will probably be the same as it is now: using images and videos to draw attention as people scroll down. As always, you’ll want to try out different things and pay attention to what your analytics tell you, but there’s a decent chance that what works well for you now will still be your most effective option in streams with longer tweets. If Twitter rolls out this update to all of its users, then the platform will change. But the difference may not be as significant as brands worry it could be. No matter how the look of your Twitter stream changes, engagement will continue to be more important than saying more is. You have other platforms that are designed for any longer messages you want to provide your audience. Twitter’s main function in your marketing likely won’t change, at least as long as the users stick around.